A killer with nothing to lose. 18 months after the 'Ragdoll' murders, a body is found hanging from Brooklyn Bridge, the word 'BAIT' carved into the chest. In London a copycat killer strikes, branded with the word 'PUPPET', forcing DCI Emily Baxter into an uneasy partnership with the detectives on the case, Special Agents Rouche and Curtis. Each time they trace a suspect, the killer is one step ahead. With the body count rising on both sides of the Atlantic, can they learn to trust each other and identify who is holding the strings before it is too late? 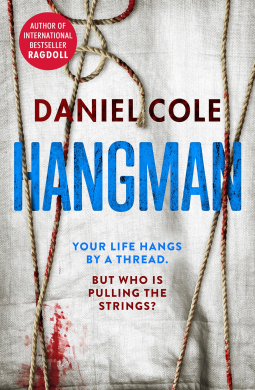 Hangman is the second novel in Daniel Cole’s debut trilogy series. Detective William Oliver Layton-Fawkes (Wolf to me and you) is still missing 18 months on from the Ragdoll murders, when Detective Emily Baxter watched him flee the old bailey after the sensational trial. Newly promoted to DCI, Emily Baxter is trying to get on with her life with no one to trust apart from former colleague Edmunds, who has moved back to Fraud, away from the gritty world of murder and terror. Meanwhile a gruesome discovery is playing out hundreds of miles away. A body is found hanging from Brooklyn Bridge, New York, USA, with the word BAIT carved into its chest. The victim was strung up by someone who has the word PUPPET carved into their own chest. Baxter is blissfully unaware of this until the authorities decide that they need her help. When FBI Agent Curtis and British CIA Agent Rouche land (almost literally) at Emily’s desk, she is as you can imagine, not particularly thrilled at being dragged into the case. There have been literally hundreds of copycat Ragdoll murders and this appears to be no exception. But when she learns of the name of the Brooklyn Bridge victim, she finds herself with little choice but to join the investigation. I can’t say too much more about this novel as it’s one that you definitely need to read for yourself! And as for the ending..., well let’s just say I can’t wait for the next novel in the series! Hangman is available now via Amazon online and all good book shops.